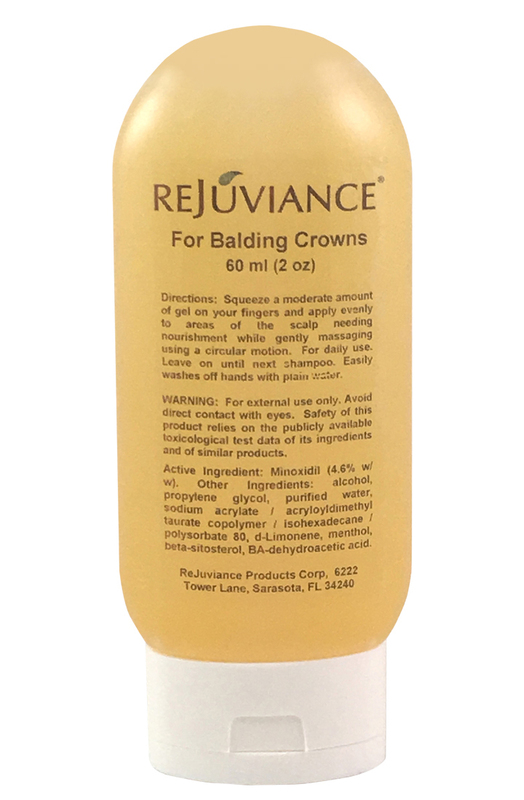 A mild, rapidly disappearing gel containing the formula for Over-The-Counter 5% minoxidil blended with ReJuviance transdermal technology to assist delivery directly to the balding hair follicles where the minoxidil is needed. This styling gel gives existing hair strands more firmness and structure, while stimulating follicles to produce new hair. Topical application. Dip fingers into gel and apply evenly to thinning areas of the scalp while gently massaging in using a circular motion. For daily use. Easily washes off hands with plain water. May leave on until next shampoo. Active Ingredient: Minoxidil (5% w/w). Other Ingredients: alcohol, propylene glycol, purified water, sodium acrylate / acryloyldimethyl taurate copolymer / isohexadecane / polysorbate 80, d-Limonene, menthol, BA-dehydroacetic acid, citric acid. For external use only. Keep out of eyes. Do not ingest. Safety of this product relies on the publicly available toxicological test data of its ingredients and of similar products. TB4 Peptide - Cellular Messaging ! Copyright ReJuviance Products Corp. All Rights Reserved. Create Online Store with 3DCart.